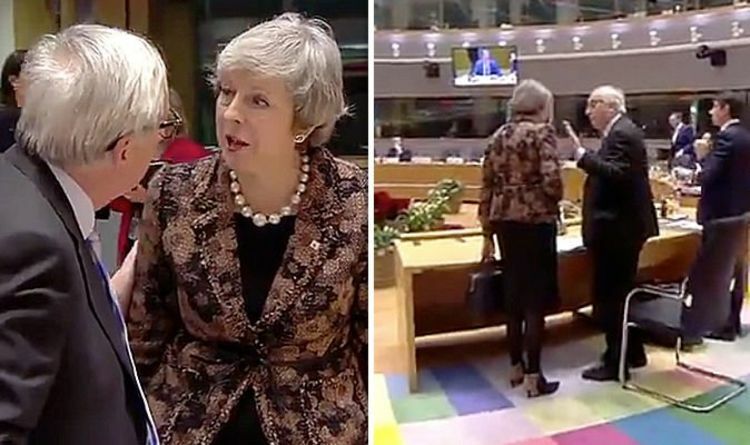 Theresa May confronted the President of the European Commission, Jean-Claude Juncker, during an intense talk in the European Council chamber. On Thursday evening the President of the European Commission insisted the Brexit Britain needed to make clear “what they want, instead of asking us to say what we want”. In the footage, the Prime Minister appears to have a stern discussion with Mr Juncker before the EU meeting in Brussels. Commenting on the video, BBC’s Political Editor, Laura Kuenssberg, wrote: “All going well”. The Prime Minister attempted to play down hopes she would be able to renegotiate her Brexit deal with Brussels when she arrived at an EU summit on Thursday. She said: “My focus now is on ensuring that I can get those assurances that we need to get this deal over the line, because I genuinely believe it’s in the best interests of both sides – the UK and the EU – to get the deal over the line, to agree a deal. “But I recognise the strength of concern in the House of Commons and that’s what I will be pushing to colleagues today. Before the summit, EU leaders were clear the UK would not be able to renegotiate the Prime Minister’s Brexit agreement. Mrs May was warned by pro-Brexit MPs that they could not support her deal, with lots of politicians concerned at the backstop element of the Prime Minister’s Withdrawal Agreement, which threatens to keep the UK in the EU’s customs union indefinitely. On Wednesday the Prime Minister fought off a vote of confidence in her leadership, with the backing of 200 Tory MPs. The vote of no confidence in the Prime Minister was triggered after Mrs May decided to push back a meaningful vote on her agreement, with MPs warning it would be voted down in Parliament.